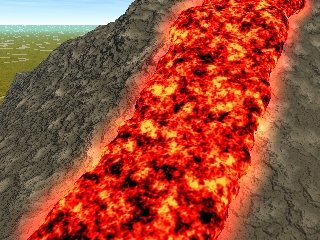 Creating a Bifurcated Lava Flow in Vue Infinite. I’m working on a picture of a volcanic eruption. The explosion part is coming on well, the smoke not so well. Today though I wanted to get something that might be a lava flow working. Baking to polygons really speeds up the render. I love volcanoes and this one looks pretty cool.